Picking an outfit for my hen party has been so damn hard. Mostly because the two parts of my hen party are so juxtaposed that one outfit just wasn't going to work for them both! Afternoon tea, followed by a punk gig.... two outfits are needed. 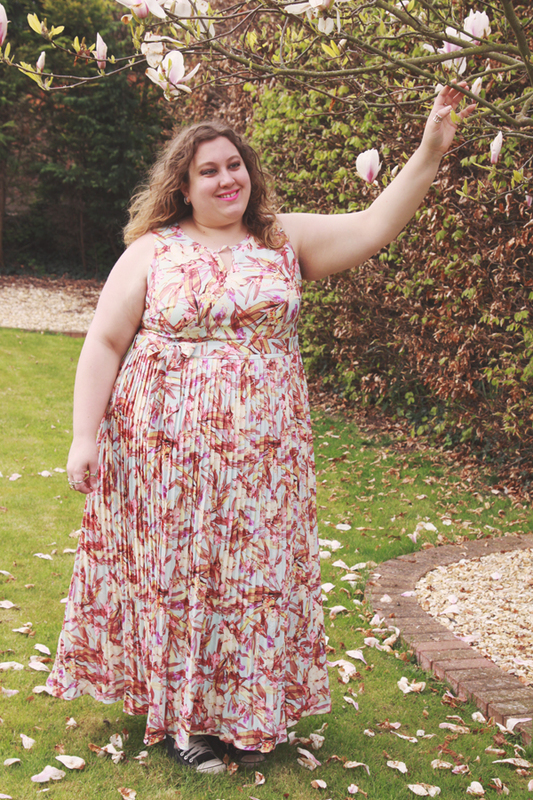 I finally have the afternoon tea outfit sorted thanks to the awesome folks at LovedRobe who have sent me a dress for the Miss British Beauty Curve Pageant, that I just can't resist wearing before hand. 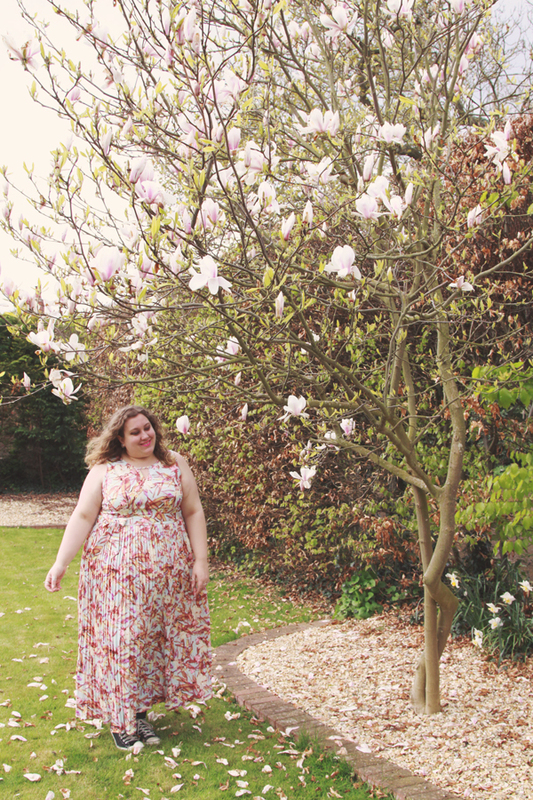 It's probably the prettiest dress I've ever owned, and so different to anything I've owned before too! Ladies and gents and everyone else.... 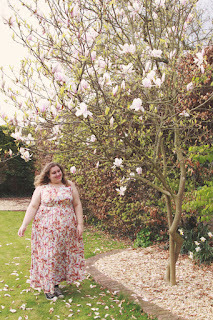 I give you me, in a floral maxi dress. Isn't it just so pretty?! 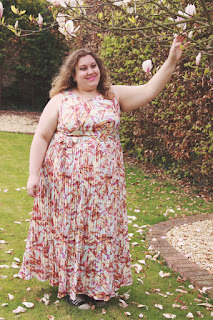 It's the LovedRobe Floral Pleated Maxi Dress* and it retails for £79. 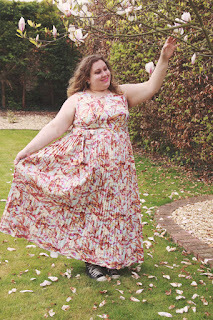 Firstly, the thing that makes me most happy about this dress is the length. I'm 5ft 11, and it's long enough for me in flats! I never wear heels, so that's ideal for me. The fabric feels so luxurious, it's all lined and best of all, it doesn't crease! I hate ironing, so that's just brilliant. It's a pale blue, which doesn't show up the best on camera, but that print is just wow. Pale blue with pink, yellow, reds, all in wonderful pastel tones. It has a cut out in the front and the back, and ties at the waist. I am aaaaaaall about the mega pleating in the skirt! It gives such great movement and looks incredible. I feel like a floral fairy princess. I plan on rocking it with sandals for a more appropriate summery look if the weather allows it. It doesn't look it, but it was pretty cold when we took these photos! I plan on swapping into something more rock and roll for the pink gig party of the hen party (Anti-Nowhere League just happen to be playing locally, so thrilled!) but this was all I could dream of for afternoon tea. I just adore it. It's very different to what I usually wear, so do let me know what you think! *this item was gifted to me, but in no way does this impact upon my opinions which are entirely my own. Check out my newest plus size clothing holiday haul here! Oh Kitty this is so dreamy and romantic - you look wonderful! Hope the hen is every bit as amazing as you deserve! Oooo this looks amazing! I love pleats, they have such an elegant look :).